> Business.com > Cut costs now with complimentary quotes from top Call Center Software providers! A business call center is no longer a grouping of agents with a telephone and list of phone numbers. 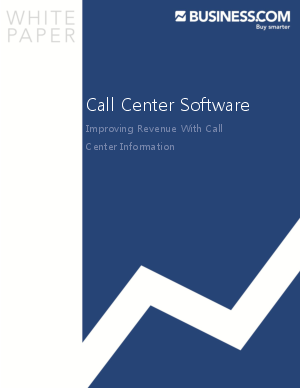 Call centers have evolved in to the forefront of many business' revenue-generating activities. They are becoming more strategically driven, and less scripted. According to a Loudhouse Research study, "69% of large B2C organizations view their call centers as business-critical revenue generators." Businesses are becoming smarter and more efficient with their call center software and staff. An inbound call center is a business subdivision that is used for the purpose of receiving and transmitting large volumes of requests by telephone. A call center, sometimes called "contact center" can take on multiple functions such as processing requests, dealing with customer complaints and making outbound sales calls. Most businesses use their contact centers to interact with customers. Many call centers operate by using work force management and customer relationship management software. This allows them to pull historical information, and generate schedules that provide the most efficient customer service.